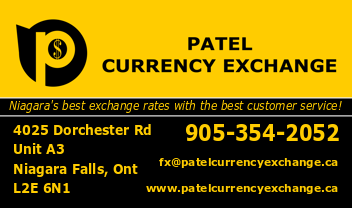 Niagara's newest home for foreign money exchange. Combine fantastic rates with amazing customer service and you'll never go anywhere else again!Here at Patel Currency Exchange, we are proud to offer Western Union's sending and receiving service. And as always, we offer amazing rates for all currencies.